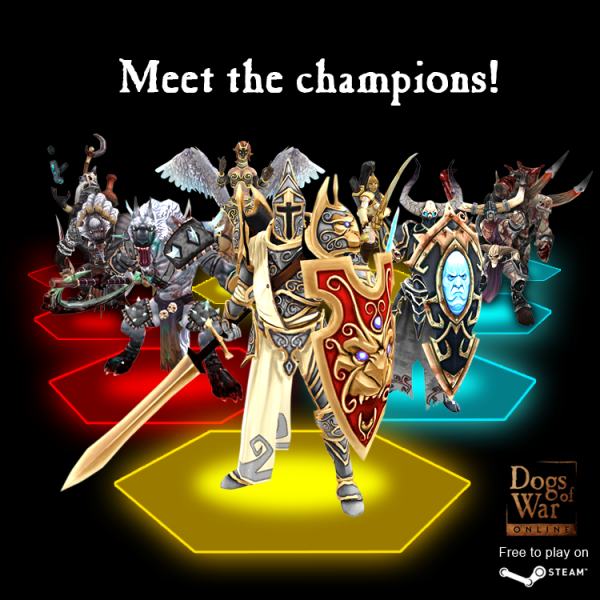 Dogs of War Online • View topic - Update 0.13.00 : Meet the champions! Update 0.13.00 : Meet the champions! - A new type of units : the Champions. Three Champions are playable for free (one for each faction), the selection changes randomly every week. - New order system in battle (ie : offensive stance). Orders are now given by the Champions to the units. Each Champion has a unique set of orders available, including one specific order. If the Champion is dead, units cannot receive orders anymore. - 54 new units (18 per faction) to unlock by reaching renown ranks. - New unit limitation rule. No more purchase limit (previously you could only get 5 similar units per company) but now you cannot send more than 10 units of the same type to battle. - New units don’t have skill tree and don’t win experience from battle. And if you were registered before the update, we gave you 20 000 Ducats to thank you for taking part in the beta. If you want to share your feedback and comments on the new version of the game, go to the dedicated thread, here.